Ali Tabrizchi, D.O., FACC, FACOI, FSCAI, is a board-certified clinical interventional cardiologist who has performed more than 30,000 procedures since he began practicing in 2008, including diagnostic angiograms, coronary interventions, peripheral angiograms and interventions, nuclear stress tests and echocardiograms. He is one of only a few cardiologists in the country who is quadruple board certified in internal medicine, cardiovascular disease, interventional cardiology and nuclear cardiology. Dr. Tabrizchi was named a Top Doctor by Baltimore magazine in 2013, 2014, 2015, 2016, 2017 and 2018 a recognition by his peers, and was chosen by his patients as one of America’s Most Compassionate Doctors in 2011, 2012, 2013, 2014, 2015, 2016, 2017 and 2018 an honor bestowed on just three percent of the nation’s active physicians. He serves as the director of his practice, has authored various published studies and is actively involved in several research trials. He is also a member of numerous professional organizations, including the American College of Cardiology, the American Heart Association, the American Osteopathic Association, the American Society of Nuclear Cardiology, and the Society of Cardiovascular Angiography and Intervention. He is a regular fixture on television and radio and speaks to organizations about the importance of living a heart-healthy lifestyle. 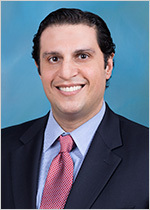 Dr. Tabrizchi earned his medical degree at Nova Southeastern University in Florida, completed his residency at Georgetown University-Washington Hospital Center in Washington, D.C., and completed his general cardiology fellowship at the Midwestern University and the University of Illinois in Chicago and his interventional cardiology fellowship at Stony Brook University and Winthrop-University Hospital in New York. He has been married to his wife, Leila, since 2007. Together, they have twin boys and a third son.